Many of the most exciting and memorable trips, expeditions and vacations include a flight or two requiring heavy, gear laden bags to be hauled though airports. 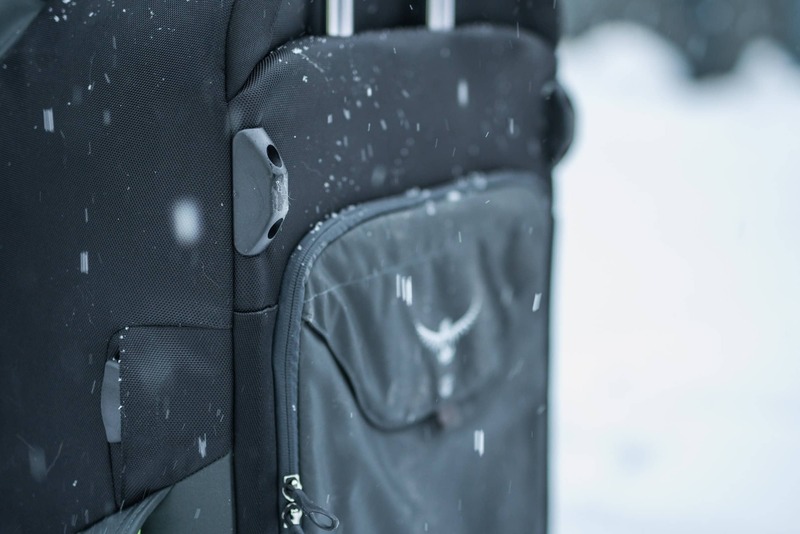 While most travelers have color coordinated suitcases that strap together into a tidy package that is easily rolled around airports, almost eliminating the requirement for any physical exertion, climbers are not most travelers. Climbers can instead be spotted at the airport or train station sweating as they laboriously drag huge, overstuffed duffel bags that simply resist any effort to be carried in a comfortable or ergonomic manner. Possibly it’s the lightweight aspect of the huge duffel, the relatively cheap cost or maybe the anti-conformist nature of it all that provides the incentive to use such labour intensive baggage. Regardless of the reason, on a recent trip I broke with this tradition, left my fleet of large canvas sacs at home and took Osprey’s new Shuttle 36”. A 130 L duffel on wheels that resembles contemporary luggage much more than it does a traditional canvas duffel bag. I found it to be a very functional gear hauler with an abundance (overabundance?) of pockets and compartments on a sturdy chassis. The duffel in the back of a Tacoma for scale, this is a large bag. 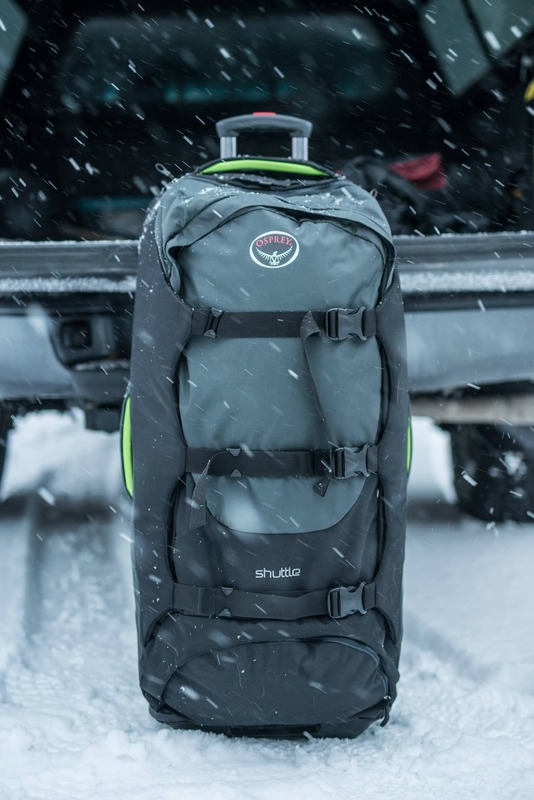 The Shuttle 36 sport’s a modified version of Osprey’s proprietary High Road Chassis made up of an aluminum frame on a durable injection molded ABS base, oversized wheels with sealed bearings and a high clearance (for a bag) design. The large wheels worked great over the rough ground found in various campgrounds and stood up well to punishment. After pulling the bag, fully loaded, along some gravel roads and down some trails there is no obvious signs of damage to the chassis or wheels. The bottom of the chassis and large wheels. The wheels are set back a bit which, when combined with the ABS legs at the top, keep the bag’s fabric from the ground when it’s laid down. This kept the back of the bag clean while saving the fabric from any wear and tear. The ABS legs noted in the previous photo, they are scraped up but the fabric is still pristine. The compartments on the back of the bag can also be seen. Large handles are located on all four sides of the bag, just where they are needed to load and unload this monster when it’s fully packed. There is also an extra handle on the top that is extendable and used to pull the bag along on the wheels. Unlike a duffel bag there are no straps to facilitate a handle on the front as the bag is too large to be carried in such a fashion anyway. Large handles are located on all four sides of the bag, just where they are needed when loading and unloading this monster. The interior of the Shuttle features a number of compartments, a few more than I felt are really needed for most people and trips but they may be useful at times. Starting at the top there is a small, approximately 5L pocket with a smaller separate interior mesh pocket. This compartment is simply great! As everything in the bag would shift down a bit when it is stood up there was always room in there for smaller items like a head lamp, toiletries, keys, etc. The inside of the main compartment has two compression straps for holding the bags contents in place. There is also a pocket in the lid on the main compartment and additional pockets along each side, all accessed from the inside. The bottom of the bag features a collapsible compartment that is accessed from the outside and that can be used for organization or to keep dirty items separate. I found that this bottom compartment harder to pack and make use of. Finally, along the back of the bag there are a two thin compartments. All told this amounts to 10 compartments, possibly more than needed, but I just used the ones I liked and left the others alone. Top pocket on the Shuttle, I found it incredibly useful as there was always room and it was quick and easy to access. A feature that I really liked are the three Straight Jacket compression straps. The straps have two possible attachment locations: one on the back edge of the bag that can reduce the size by almost half and another on the front edge for a full load. 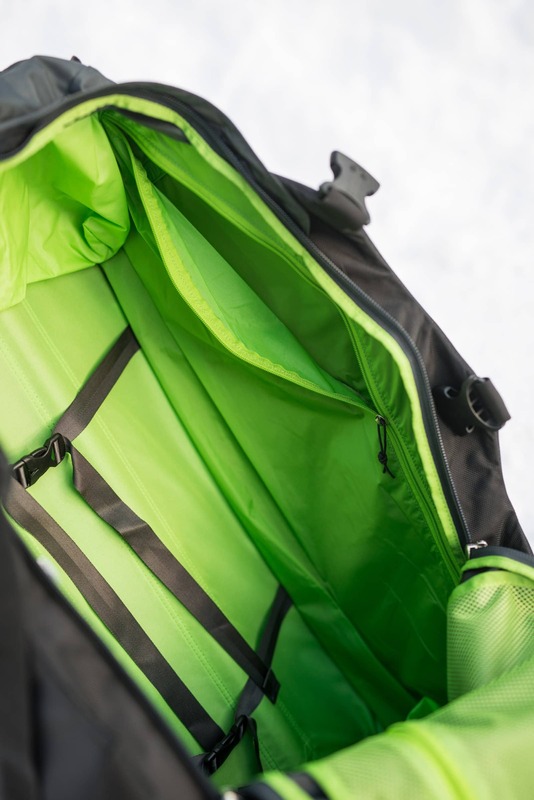 The U-shaped zipper that accesses the main compartment is quite loose and so is easy to zip up, once closed the compression straps are done up to ensure that all the equipment inside the bag is held securely in place. 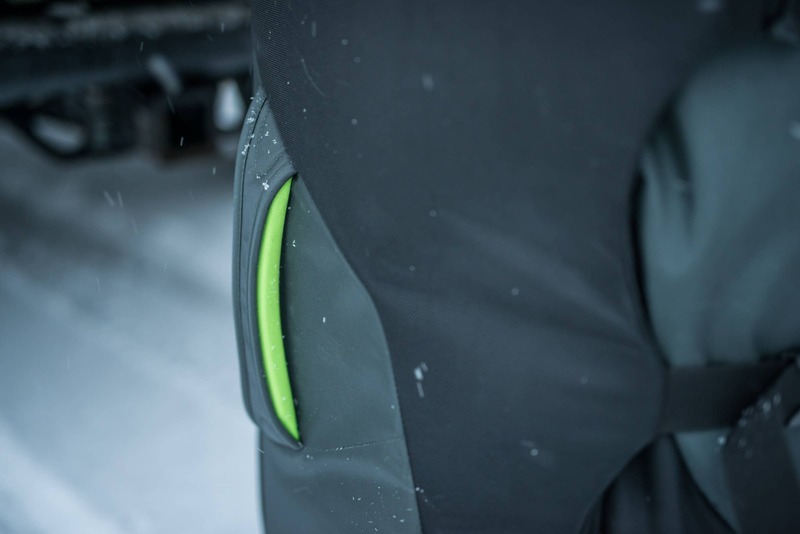 The fabric that the compression straps are attached to fold over the zippers to the main compartment protecting them from damage while in transit. 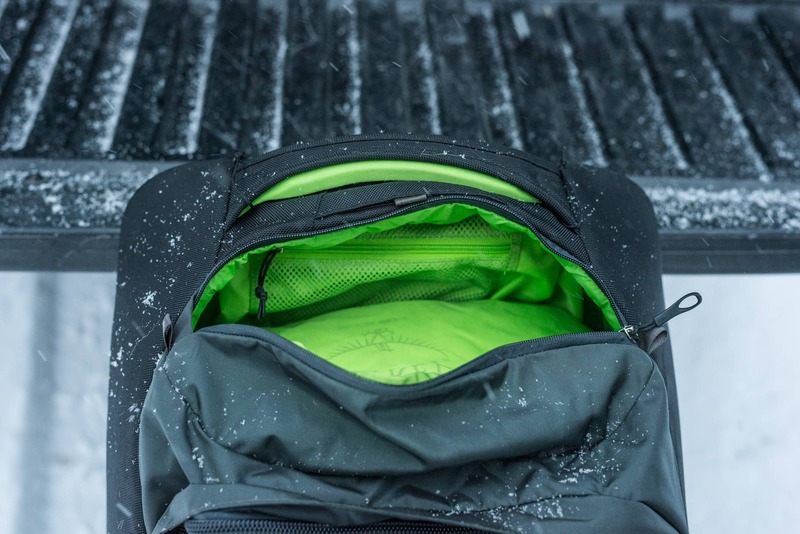 Overall a great feature for protecting the contents of the pack, adding security to the main compartment against a blowout and enabling the volume of the bag to be decreased to the size needed. Compression straps attached in the low-volume position. Note that only two of the three straps are used in this set-up but it still seems to work well. The top corners and sides of the Shuttle are made of 1680D Ballistic nylon over a foam pads. This fabric is not quite as durable as a 1050D nylon but is lighter and the combination of this fabric with the foam padding does a great job protecting the gear inside when it’s subjected to the rigors of airline travel. After a few flights on my trip the sides of the bag with the padding and 1680D nylon was unscathed. Unfortunately, a small hole was torn in the bag by the airport’s baggage handling system in the bottom compartment where the 1680D Ballistic nylon is unpadded. I had my climbing rack in there which likely contributed to the tear but had this area been padded like the sides this damage would likely not have occurred. Compression straps in the full-volume position. The black fabric is the 1680 Ballistic nylon. The side portions of the fabric are padded. Given the numerous features and the large size of the Shuttle it has quite a modest weight (9.13 lbs or 4.14 Kg), one of the lightest wheeled bags of the size that I could find with the exception of some large canvas sacs with wheels. The light weight is great when flying as every gram counts. The inside of the main compartment. Luggage straps can be seen along the back and one of the interior side compartments is visible. One item that I felt would have been great are some backpack straps as it’s not always possible to role the bag around depending on where you’re traveling and it’s a hard bag to carry when full due to it’s size. However, in talking to a number of testers and other climbers it seems that I’m the only person that is interested in such a feature which is likely why it’s not on the bag. Pros: Light weight, sturdy frame and chassis, three straps that are great at both compressing the bag and protecting the main compartment zippers, really useful top compartment, lots of handles. Cons: No padding along the bottom compartment and the layout of this compartment makes packing the bottom of the bag a bit harder. 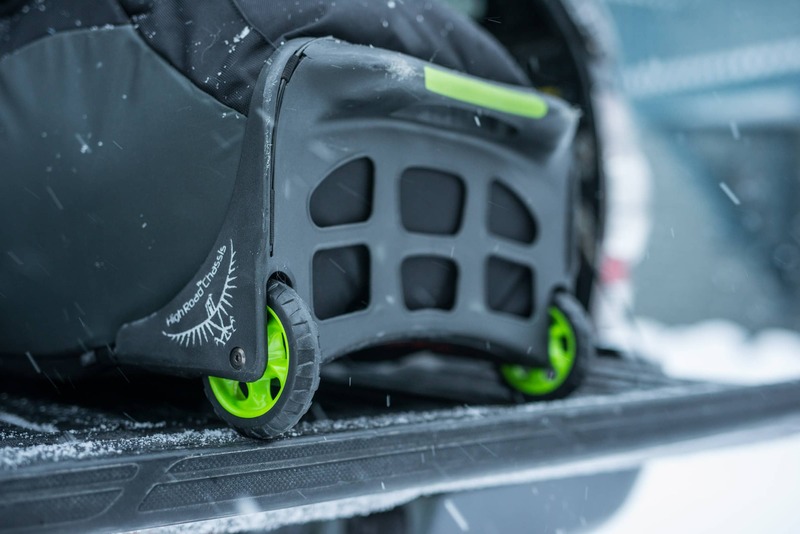 Overall: The Shuttle is basically a piece of conventional luggage that has been adapted to take the abuse climbers are likely to dish out and it works really well in this capacity. 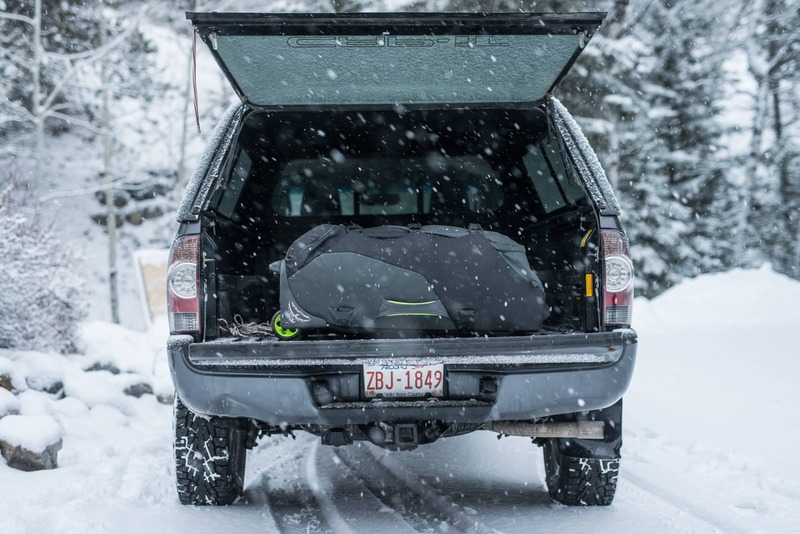 The padded sides protect the bags contents and improve durability, compression straps protect the zippers and provide insurance against an overstuffed bag blowout and the sturdy off-road type chassis and wheels make short work of rugged terrain all while still maintaining a fairly light weight. What this bag is not is a duffel bag with wheels. 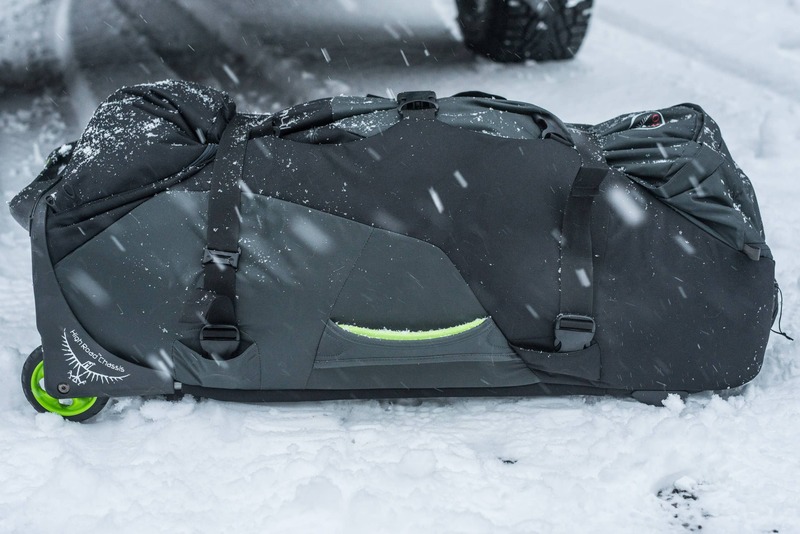 If you are looking for a durable, drag though the dirt, piece of luggage this is it. Product photos by Raf over at The Alpine Start. Osprey provided a sample for review but as you probably know by now, this doesn’t influence our opinion of the product.